SAN FRANCISCO, Calif. /California Newswire/ — S.F. 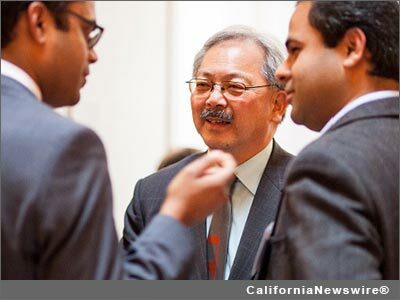 Mayor Edwin M. Lee, Supervisor Jane Kim and City College Acting Chancellor Susan Lamb announced this week that starting next school year City College will be accessible for all California residents living in San Francisco and taking courses for credit. To ensure the new program meets the needs of City College and the students it serves, Mayor Lee tapped key staff from the Mayor’s office, City College, the San Francisco Unified School District, the Board of Supervisors, the Human Services Agency, the Department of Children, Youth and Their Families, the Controller’s Office, and the Office of Economic and Workforce Development to develop an economic model that is beneficial for students and sustainable for the City. “A little over a year ago, we set out to establish the nation’s most progressive program for universal free higher education that would be inclusive of all San Franciscans. Today, we can and should celebrate what is truly the people’s victory because this would not be happening without the partnership of educators, students, labor, and every San Franciscan who supports the idea that K-14 education is the key to opportunity,” said Supervisor Jane Kim. Free tuition for all students who are California residents living in San Francisco. $500 annually to full time students that have a Board of Governors (BOG) fee waiver to use for books, transportation, supplies, and health fees. ($250 per fall and spring semester). $200 annually to part time students who have a BOG fee waiver to use for books, transportation, supplies and health fees. ($100 per fall and spring semester). The plan will also provide City College with a one-time amount of $500,000 (funded already in FY16-17) for capacity and systems to implement the plan. City College of San Francisco (CCSF) is a public, two-year community college overseen by the Accrediting Commission for Community & Junior Colleges of the Western Association of Schools and Colleges. Since its founding in 1935, City College has evolved into a multicultural, multi-campus community college that is one of the largest in the country. CCSF offers courses in more than 50 academic programs and over 100 occupational disciplines. There is a full range of credit courses leading to the Associate of Arts and Science degrees, most of which meet the general education requirements for transfer to a four-year colleges and universities.